We, The Arrested Lawyers Initiative, sincerely congratulate your European Lawyers Day. Lawyers are the sine qua non of rule of law and fair, independent, impartial judiciary and also the most important and effective safeguard against torture and ill-treatment. Despite the first article of Turkish Attorney’s Act which says “Lawyers are the constituent component of the judiciary”, Turkish lawyers are under imminent pressure. There has been a relentless campaign of arrests which has targeted fellow lawyers across the country. In 77 of Turkey’s 81 provinces, lawyers have been detained and arrested on trumped-up charges as part of criminal investigations orchestrated by the political authorities and conducted by provincial public prosecutors. As of 25th October 2018, 590 lawyers have been arrested (since 15th July) & 1548 lawyers are under prosecution. So far, 196 lawyers were sentenced to long imprisonment. Some of the arrested lawyers were subjected torture and ill-treatment. All persecuted lawyers are being charged with terror-linked offenses such as being the member of the armed terrorist organisation or to run an armed terrorist organisation. Pursuant to Turkish Penal Code, these two offences require 7,5 to 22,5 years imprisonment. 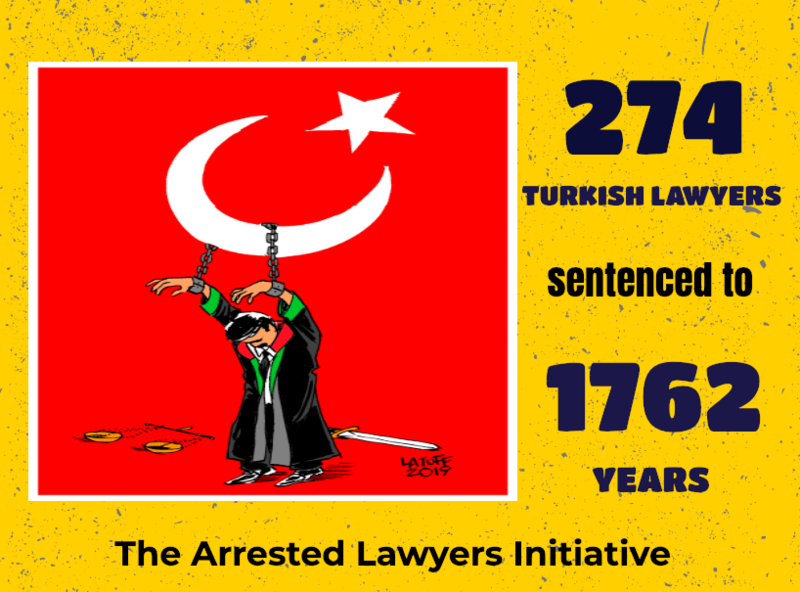 The Turkish government has also targeted Turkish lawyers’ right to free association. 34 different lawyers’ societies or associations have been shut down since the declaration of the state of emergency. Following their closing down by a government decree, all their assets have also been confiscated without compensation. We, the Arrested Lawyers Initiative, would be most grateful if you remember arrested Turkish lawyers and speak up against the ongoing persecution of Turkish lawyers on the occasion of European Lawyers Day.